Nigel Mallon has just returned from Peru with wonderful images of his visit to the Huchuy Yachaq charity, in Cusco. At Huchuy Yachaq, Nigel took photos of the beautiful jewellery the local women produce in an effort to raise additional income. Nigel’s photos will be used in a leaflet given to donors, volunteers and visitors to the project. During Nigel’s visit he also offered local families to have their childrens’ photos taken. A rare opportunity! “The contrast between the’ haves’ and ‘have nots’ is always stark and Cusco is no different. From the comfort of my hotel each morning I could see the blue school project building and the neighbouring community with 800 families and one water tap! 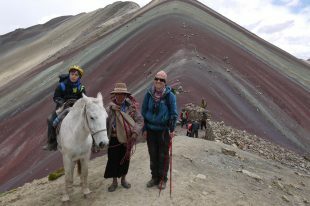 Huchuy Yachaq is a project Andean Trails supports each year financially, by donating parts of our profit to the project. It enables the children of the impoverished Hermanos Ayar suburb of Cusco to attend nursery and school and seeks to empower the local women. Children aged 3-5 attend nursery classes at Huchuy Yachaq, and older children are encouraged to attend study and games sessions held each afternoon and participate in holiday projects. As well as providing the community with a space to help their children play and learn, the project also focusses on activities to strengthen family ties and improve family circumstances, creating a safe, happy childhood in communities that have to struggle with unemployment, alcoholism and violence. Our annual contributions have so far paid for employment of a teacher, educational books and games, tables and chairs, structural improvements to the community-owned building including adding toilets, school materials and books for the children and holiday programmes. By booking through us, you have already played a part in our contribution to the project, and we would like to say a big thank you for that. If you’d like to do more to help, please contact us on mailto:info@andeantrails.co.uk. Donations are vital and are very gratefully received to ensure the charity will continue providing much needed support to the community. Only USD 22 are needed to supply a child with all materials for one year of school, and even smaller amounts make a world of difference. You can find out more about Huchuy Yachaq here and can read Maria Lucas’ blog about her experiences when volunteering in the community.